The city of Florence is one of the fastest growing in Oregon, and is popular with both tourists and retirees. 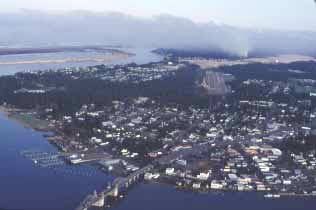 Located near the mouth of the Siuslaw River, Florence is an hour's drive west of Eugene on Highway 126 and roughly at the heart of the Oregon Coast on Highway 101. The Oregon Dunes National Recreation Area begins at Florence and runs about 50 miles south to Coos Bay. Recreation on the sand dunes is one of the many reasons people come to Florence. Others include playing one of the two 18-hole golf courses, fishing on the lakes and streams, enjoying the new casino and hotel, shopping in Old Town, and of course, checking out the Pacific Ocean beaches.